I used to go by this place on the #75 bus all the time, on my way to play disc golf in Pier Park. I would see tables outside and read something about a soda fountain, and I’d think “Man, I need to go there.” Problem was, I couldn’t catch the name of the place. In fact, now that I’ve eaten there, I still don’t really know what the name of it is. But I know what people call it. And if you think that’s the same thing, you don’t know small-town America. Folks call it Pattie’s, because Pattie owns it, runs it, and generally occupies it. She was there when I was, sitting at a table with some regulars. It’s Pattie’s place. It might officially be called Pattie’s Lunchbox, or the Home Plate Deli and Fountain, or Pattie’s Home Plate Cafe … but if you ask the old-timers in St. Johns, they’ll tell you it’s just Pattie’s place. And most of them know Pattie, too. But I didn’t know this when I decided to check it out. I looked around on the web for breakfast places on North Lombard Street, and I wound up at the John Street Cafe, on the other side of the street-and in another decade. The John Street is white tablecloths, the New York Times, flowers, original art and sour buttermilk pancakes. All well and good-and not what I was looking for this particular morning. So I walked across the street, and when I entered Pattie’s, four guys at the counter stopped talking, looked up at me, gave me the head-to-toe, then went back to their coffee. I felt like I was on the road! You might not know this, but St. Johns used to be a town, founded in 1865, and it merged with Portland in 1915. Pattie’s is in the middle of “Downtown St. Johns,” and when you walk in, you couldn’t be further away from what many people think of as Portland: the Pearl District, jogging paths, urban planning, peace marches, lattes and so on. 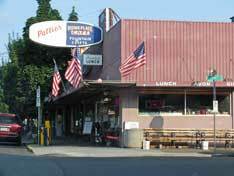 Some of the folks in Pattie’s looked like they only “make it down to Portland” once a year or so, and couldn’t imagine why they’d go any more than that. I think I was the only person in there who didn’t know somebody else. Or everybody else. The guys at the counter, for example, appear in every small-town cafe in America. Three of them were around 70, and the fourth was about 50, soaking it all up, laughing at everything the older guys said and looking for all the world like an Old Guy in Training. orange juice and got a bottle of Langers. I asked for maple syrup, and they brought out a bottle of Aunt Jemima. The Special was a “sausage dog,” two eggs, hashbrowns, and coffee for $6. I wondered if you can get anything at the John Street Cafe for $6. jewelry, fish lures, plastic flowers, you name it. My favorite moment was when a Young Portland Couple came in. You know who I mean. He had sideburns, a thin figure and thick-rimmed glasses. She had matching workout clothes, a bike helmet, and a newspaper. They looked at each other briefly, and so did everybody else in the place. They surveyed the scene, made a loop through the store, talked in hushed tones over near the kids toys section, then casually strolled on out-and across the street, I’m sure. Probably rather wait in line at the John Street than cross the cultural divide. They don’t know what they missed. There was a guy telling several people about a great big 9-11 memorial model truck he’d seen at Jubitz, with the names of all the victims painted on the side. Went into quite the detail about it, too. A woman asked where it was, and he gave specific directions to where in Jubitz it was. She knew exactly where he meant, too. So did I, for that matter. On the right, just as you’re walking out the main door of the shop, over by the registers. Never been to Jubitz? I bet you didn’t know they’ve got live country music every night there, did you? And a movie theatre? That’s right, folks-don’t you forget it, and be thankful for it: Portland is a little bit John Street, and it’s a little bit Home Plate. Reservations? I didn’t have any at all! Health Options: Juice in bottles! Was it on this website or in a food magazine that I recently read an article about America’s obsession with “talking up” downhome cooking? The piece was brave enough to state that French food and sophisticated dishes actually tasted better than grilled cheese and the ubiquitous hamburger. In regards to this review, maybe I should refer to John Street Scrambles and Grade B real maple syrup might just taste better than frozen industrial shredded hashbrowns and eggs over easy. Really – what next? Are you going to review a Denny’s and rave about how interesting and brave it is that they serve pancakes made from Bisquick and, oh shucks, there was a real truckdriver in there? Normally, I like the reviews on this site, but between the awkward Carlyle discussion and this commentary which is condescending to both the regulars at Patty’s and the couple who entered while you were eating and dared not partake in some Aunt Jemima, I’m having my doubts. What a great overview. I love the way you made the place come alive, and don’t understand the previous comment. This is obviously more of a portrait than a review. More please! Welcome. I think you did a swell job giving us that slice of life. Makes me want for a piece of mile-high lemon meringue pie. I really like the ‘slice of life’ description that Nancy notes, but I’d also like some more details about the food, please? What’s it taste like, where does it come from, is it hot/cold enough? How’s the coffee? I don’t really take a position that the food at Pattie’s is any better than John Street. I’ve never even eaten at John Street, though I intend to. I was going on an assumption about that place, and what I intended to come through in the article is that sometimes I’m in the mood for a fancy scramble and real maple syrup, and sometimes I’m in the mood for regular old hashbrowns. Sometimes I want to read the New York Times and drink Stumptown, and sometimes I want to sit in a place where people know each other and are sociable. My goal here was to give you an idea of what you’ll find if you enter Pattie’s, not make the claim that its better or worse than any place. I’m not into that, and I don’t intend to give stars, either. And I don’t think I was being condescending to anybody, but I’ve run into that before: Once I wrote an article quoting a Southerner with a strong accent, and I tried to write his words somewhat phonetically, and people jumped on me for making fun of him. But I felt it was important to write the guy the way he sounded, just as I felt it was important to describe who was eating in Pattie’s and what they were doing. Amen to the merinque pie — especially if it comes out of one of those spinning coolers! And finally, I will (and do) describe the food more in other reviews; thanks for that reminder and feedback. I eat so much breakfast that sometimes it blurs together, and sometimes I get lazy in writing about it. Thanks again for the reminder. I should have explained more fully. Paul’s pieces tend to be more of a portrait than a review, I’d almost call it food writing. You can read them and get an idea for the feel of a place, and I think they are fun to read. Other new writers will be doing more detailed reviews of breakfast places, focusing on the food. Nice slice of life in St Johns. You know, places like this are rapidly evaporating in Portland as the demographic changes here and Paul captured the importance of local restaurants in building community for a variety of income levels and lifestyles. I enjoy this site a lot; the way it darts in to give a glimpse/snapshot just seems to work so well sometimes. Great piece – I really got a feel for the place and these mom and pop places really intrigue me and I rarely have the chance to drop in. My other fascination is dive bars – it would be great to do a round up of those altho I know some folks on-line have done that – there was a guy that used to do a column for the Astoria alt. paper (Hipfish I think) – it was all about dive bars on the coast. It was great. That first poster needs to chill a little. Just wanted to say that I really enjoyed this! Great review. Good to see Patties getting positive recognition. Been eating there for years. Was even there the very day of the shootings. I read an alternative review of Patties on livejournal a few months ago that detailed the food a bit more. Pattie’s has to be experienced a couple times for one to really understand its importance to St Johns. So far, they have survived a severe loss of customers after the total Columbia Villa demolition and re-build. Many new residents have yet to become regulars, but they really should. They’ll be welcome and feel part of a real community! The # 75, 4 and # 17 buses stop outside the door, near the main Lombard curve downtown, a block east of Starbucks. Pattie’s Homeplate Cafe is like a Community Center. They even host an old-fashioned Sock Hop monthly. Pretentious people could experience a bit of liberation by getting to know the real folks who visit here, the historic residents of St Johns…who welcome new neighbors. BTW, if you see the Fish Sandwich on the menu it is a must. Pattie looks for just the right breads for each Sandwich, to present it in down-home comfort-food American style. I get a giant lemonade, but I have friends who are hooked in Pattie’s HomePlate milkshakes. A great place to get take-out for a riverside picnic, like when you are going to the Jazz, Blues or Pirate Fests under the Cathedral Park bridge. St Johns ROCKS. Thanks, Jules. These are great notes. There are just so many things to know about a place! I’ve only been to Pattie’s once, but next time I’m up for a game of disc golf at Pier Park, I’ll stop in for a fish sandwich. I’m from Sydney Australia and recently went to Portland for a holiday. Have never been to America and I have to say – Portland was the best place I have been to on any of my travels. Anyway my friend took me to Patties and man was this the best place. The food was great. The people were great. The staff were great. My first experience of Biscuits and Gravy and Chicken Fried Steak and I’m still craving Pattie’s C.F.S. down under! It is a great place were even though it took you back in time, for an Aussie – this is the kind of Americana I wanted to see. And thoroughly enjoyed it. I so remember some of ST. Johns and eateries. Back in 1949 to 52, My dad used to take me out for breakfast to a place named The Big Plate restaurant. A block from the old Police station next to the bridge. The plates were huge and one pancake would fill you up. I also remember Floyds Barber shop where I had my hair cut. Great place to live. We moved on into the Portland area in 1953. I always spent allot of time there after. I knew the two sets of twins that used to own the ST. Johns theater. Great people. They made all the younger kids and on the Sat, Matinies (spl). Ughhhh. I am over 75 now but I have many pictures in my head of ST. Johns. I also owned ST. Johns Paint and wallpaper in the mid ’70’s. We recently had desert at Pattie’s and we are sort of a young and hip couple in our late 30’s. I was drawn in by the retro outside decor. The lady at the door welcomed us in and asked if we could sing. The patron’s inside were just the opposite of what I was expecting. It is a more mature crowd with that extremely friendly old time diner feel which I love. The lady outside welcomed us to come in and sing Karaoke which they have on some weekends. (starts early.. at 5? )I have friends with kids that love karaoke but usually can’t go because of the hours and because one can’t take kids legally into a bar. I think it will be our go to place for dinner that does not serve alcohol to bring my friends with kids in tow to sing karaoke. 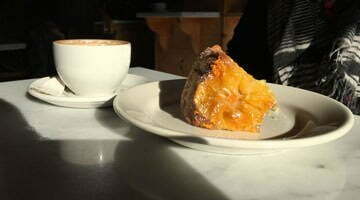 The pie is great, and from the evaluation of the prices, I will definitely be back for dinner. This is a great place to people watch. The patrons can be amusing. The hipster crowd may not get the kitschy coolness of Patties. Will the hipster crowd continue to copy the style of the original and make it ironic? OR appreciate what is the REAL Original kitchy cool friendliness of Patties home plate?